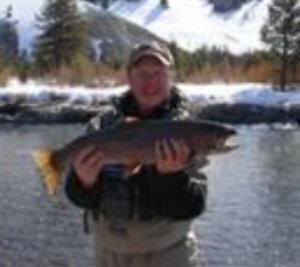 If you are looking for Michigan fly fishing guides or fly fishing lodge packages take a look at this list of recommended guides. There are plenty of guides available to choose from and many of them advertise their services throughout the website. Here is a list of a few of them arranged by the state they provide services in. If you have not tried a guide before you may want to give it a try. A good guide will teach you new tactics that will help you be successful for years to come. Good luck and fish on! Michigan is a great state to fly fish. These are some great places to fish, so to increase your odds I would strongly recommend a guided trip. Drift boat fly fishing guide service. Providing guided service year round. on some of the best rivers in Michigan. be sure to take a look at this list of rivers. Michigan has some great fishing and many streams to choose from. From the Manistee to the Muskegon river's people come here from all over the country to test their skills against these great fish. Do you know the exact spots to fish, or the best tactics and flies to use. You may think you do, but professional guides do this daily. They are you best bet. Be sure to increase your odds no matter where you fish by having the experience of a local guide. These guys do it for a living, the know the best water and what to use.....do you? Fish on!